Several years ago I first watched a DVD of the "Phantom of the Opera". I was appalled. It seemed like a twisted, twisted love story and I denounced it forever. In the middle of last semester, the school had a masquerade and one of my roommates kept playing the Masquerade song. I remembered how catching it was. I admit I was hooked and started listening to the soundtrack again. I told myself it was just a phase. Honestly. I was making new music CDs for my drive back home when I realized I should have an "Andrew Lloyd Webber" CD. So I selected my 4 and 5 star songs from him and saw it would take two discs. "There is no way I like enough of Evita, Joseph and the Amazing Technicolor Dream Coat and other songs I don't even know what they belong to, to justify two CDs," I thought. I looked again and realized that most of the first CD was from the Phantom of the Opera. I guess I have to admit that I do really like the Phantom, at least the music. But there will be a "Phantom of the Opera" CD too. The grand sweeping melody of the Overture, the bone tinglingly "Think of Me", the bright and punchy "Masquerade", and even the sobering "Learn to be Lonely" are just too good to not be listened to. I want to say at the beginning that I hope you're not reading this because you have consciously chosen to spend time with a jerk, meany head or someone who is otherwise not good. I say this because these people shouldn't really be associated with (at least not while they are being mean) if it is at all avoidable. I understand that sometimes forces beyond our control compel us to spend time with such people so I thought I would offer some suggestions. Punch them in the face, stomach or other random place. While this course of action might get you in trouble, it can be quite relieving for you and would effectively communicate your feelings to the injure person. The punch might also serve as a wakeup call in which the Mr. Mean might adjust his attitude while he adjusts his face. Go on a Roller Coaster ride because let's face: when you're zooming at high speeds on rickety rails you really don't care who is sitting next to you. "Study" with them in the Library. The key isn't to be studying the same thing with them, then you would have to study together. Rather, you should be studying as distantly unrelated a topic as you can so that you can sit in relative silence letting your feelings towards them simmer. Prank call them, especially while they are in class. If they spend so much of their time being mean chances are they forgot to silence it. This will give you the satisfaction of knowing you embarrassed them and even if you didn't you would really never know. It also gives them a reason to continue to be mean to you. Go ice skating with them. While spending "quality time with them" you can imagine the ice suddenly melting and them drowning at the bottom of the rink. Actually sabotage the ice rink with them because you realized that if they would drown, so would you. Beside, industrial "accidents" happen. Kick them in the shin. Admit it; you would feel a little better. Better: Play soccer with them and then kick them in the shin. Admit it; you would feel a little better. Best: Play football, or another full contact sport, and tackle them every chance you get. Figure out who drives them crazy, then hangout with those people. Figure out who the jerk likes, then hangout with them. You never know, you might find some sympathetic spirits. At worst you would realize that the jerk is alone in the world. I was going to write "play tag and other children's games" and then I realized that this could prove detrimental to your attempts to remain healthy and well after spending time with the not good person. Watch "Anne of Green Gables" with them. Now can be a jerk for long with all that talk of "kindred spirits". Make a dessert with them. At least something would be sweet. Talk to them, it will be good for them and it will be good for you. You may find out that you are the only friend they have (a phrase here which means "the person closest to a friend they have"). Or, you may find out way they act the way they do. Give the meany head a sucker. Even if they don't smile, you will. Sucker! Go on a long, long drive in the country. Really, it doesn't matter where you go or even if you go at all. By spending mass quantities of time together the jerk will either begin to grow on you, you will become more like them, they will become more like you, or someone will have died from strangulation. Buy a small potted plant, name it after the jerk, and say wonderful loving words to it all night long (you can sing too). Remember that the jerk is someone's child and that if the parents could survive raising them, you can survive a few hours with them. Be cautious to not mention, intimate or even hint at leaving on long trips even if you think they wouldn't be remotely interested. Chances are, if you've spent this much time with the jerk you really don't understand them or yourself and they will want to accompany, call or heckle you while traveling. Visit a museum with them. One of several things might happen: you might lose them, they might lose you, or the dinosaurs might come to life and eat them (hey, don't rain on your own parade here). Go to a baseball game with them even if you don't like baseball (you can count ad spots or something else productive), there is a chance that America's pastime is jerk's pastime too. Take an Interpersonal Communication class with them. They might take the hint, but even if they don't you could your skills. Give the jerk a chocolate every time they do something good. Soon you'll have them trained to good behavior. "Kidnap" the jerk, go on a long drive and drop them off somewhere. A circular reference is a set of equations that reference each other in a loop. The looping causes the formulas to repeat infinitely and are thus difficult to use. For example, I calculate the cost of my widgets (a generic and fictitious product that economists often use in their models) by adding together my labor, facilities and materials costs times 1.5 so I can make some profit (the formula would be (l+f+m)*1.5). Let us say that each widget takes an hour to make and so they cost: $8.40 for an hour at minimum wage, $5.00 for the facility (building and utility costs), and $10.00 for the materials. At my 50% markup the finished product would cost $35.10 each. Next year, because the CPI increased, minimum wage increased to $9.00 an hour. My widgets now cost $36.00 each, a 3% increase. The next year minimum wage increases by 3% because I charge 3% more for my widgets and the new minimum wage is $9.27 an hour, my widgets now cost $36.41 each. These calculations do not take into account the increased expense of materials (labor increase affect the cost of raw materials as well) and so each year's minimum wage increase adds to the next year's inflation rate and thus the minimum wage endlessly increases except in a reccesion. In the Oregon law, minimum wage remains the same if the CPI is negative and so even in a recession or when a market is flooded with cheaper product the minimum wage remains the same. Remember the Joint Economic Committee Report said the employees getting paid minimum wage are: high school and college students working part-time, not people with families working full-time. Allow me to summarize what students spend money on in order of cost: school, toys and fun. Schooling, like most markets, is subject to the laws of supply and demand and most students can't dream of paying for school by themselves and so it should not be part of the discussion. That leaves us with: fun and toys. This means that most of the minimum wage increase goes to pay for non-essential items that, while providing a higher quality of life, are really luxury items (e.g. iPods, cell phones, text messaging plans, music downloads, etc.). While money spent in these industries does reenter the economy, they are industries with incredibly high margins that reflect the level of demand rather than the cost of manufacturing. For example, no matter how many times a song is downloaded there will be another copy available for download for the next customer. The producers' only worry is making sure they meet the original investment costs; everything past this amount is profit. Another example, the price of the highly popular iPhone isn't a markup based simply of original developments and continued production costs but instead is based on the most the company can charge for the phone while increasing market share at an acceptable rate. Consumers pay the added expense for the "coolness" factor. Basically, these markets are much more flexible at soaking up disposable income than normal consumable products. Minimum wage increases affect more than just those on minimum wage; they affect everyone paid more than minimum wage. Imagine an employee getting paid $9.50 an hour instead of the $8.40 minimum wage. In theory this employee makes 13% more than the average cost to live, not bad for an entry level job. The next year, because my widgets increased the CPI, minimum wage increased to $9.00 an hour. Now the employee only makes 6% more than the average cost to live, in essence the State has issued pay cuts to all non-minimum wage employees. Continue to the next year when minimum wage increases again to $9.27 an hour and the employee only makes 2% above the average cost of living. A job that used to give an employee about $216 a month ($2,588 a year) as disposable income (money beyond the cost of food, transportation, residence, etc.) changed to $91 a month ($1,098 a year) then to $41 a month ($490 a year). While increasing the wages of part-time students (the ones the Joint Economic Report says is making minimum wage) the State is decreasing the wages of full-time working families (the ones who make more than minimum wage). The State has pushed the lower class towards to upper class and in the process squished the middle class and lower class together. As minimum wage continues to increase each year, employers have to make a choice: increase wages, decrease wages or fire employees. This is a triple no-win situation for employers. The employer may not want to increase employee wages for two reasons. The first is that consistently increasing a worker's wage gives the worker the impression that they are entitled to raises, which is often not the case. The second reason is that in most cases the worker is not worth any more year to year. Except in cases involving unions and minimum wage, the going wage for any job is determined by supply and demand. For example, a chain store may pay more for cashiers in a metropolitan store than in a suburban store because it is harder to find qualified workers in the larger market than the smaller market. Another example, doctors and lawyers don't get paid a lot of money because their jobs are particularly hard but because there are not a lot of them to do the job. Job markets obey the laws of supply and demand for everything more than minimum wage. If the employer chooses to not increase employee wages, they have in essences chosen to decrease them. In theory the minimum wage increase is due to an increase in the cost of living and if the employee makes the same this year as they did last year then the employee has less disposable income. This effect may not be noticed the first year, but will be noticed before too many years. Upon noticing this trend employees are likely to work less and become less loyal, demand a raise or search for other employment. Of course the employer may decide that with the spiraling increases in minimum wage the position is no longer worth the added expense and therefore the worker is expendable. Expendable employees don't often last long. Minimum wage always makes showing the value of a job more difficult. If an employer wants to get an entry level worker that is above average they often offer to pay the position a little above minimum wage, say $9.00 an hour instead of $8.40 an hour. Being a little higher than minimum wage becomes increasingly more expensive as minimum wage increases. I hate going through great lengths to identify problems in a system without suggesting possible fixes, so here is my suggestion: get rid of minimum wage. "But Daniel, if there is no minimum wage capitalist pigs will take over and the economy will be destroyed." No, no my weak believer. I argue that if minimum wage were to be abolished that the job market might tank and but would then correct itself. Every free market (free from government intervention) always, always corrects itself. If wages plummeted so would income and costs. As income dropped margins would increase, making capitalists happy for a while but a lack of income would force prices down until local job markets balanced out paying employees what they should be paid. Getting rid of minimum wage might also take a significant dent out of unemployment because companies could afford to hire workers for things that don't justify the expense of current minimum wages. "But Daniel, workers were abused before there was minimum wage." Not so my young believer, well not because of a lack of minimum wage. Workers were abused because they had no right to safe working conditions but now we have things like the Bureau of Labor and Industry (BOLI) to enforce wage payments to employees and Occupational Safety and Health Administration (OSHA) to make sure employees are working in safe conditions. The problem of employee abuse was more of a problem of no enforcement of wage contracts and abuse of human rights than a problem of not paying them enough. Free markets always, always correct themselves. A compilation of Joint Economic Committee reports about minimum wage can be found here. Disclaimer: I fully understand that there are exceptions in every case, especially in statistics. I fully understand the words of Doug: "You can't manage to the exception." They're exceptions, not the rule and even if all our time is dedicated to handling exception we still would not be able to address them all. It is best to manage to the rule, especially when talking about a state full of people, and let the exceptions be handled on a case by case basis. This was on the Burger King bathroom door. 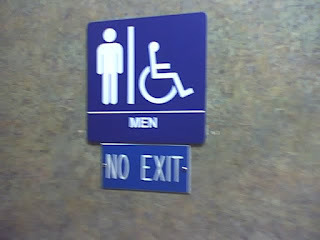 I'm still trying to figure out what the "NO EXIT" part is about. By the way, the sign is on the woman's bathroom too. It was a cold and wintery morning when I was headed home from school. The semester had just ended and I was excited to be done. That morning I had woken up twice, once to take a roommate to the bus stop so he could fly home and the second time was my time to go home. Between the two waking up times several inches had fallen, but we headed out anyway. The going was slow and one of the mountain passes was closed for an hour, but we got out of the mountains safely. The storm we had been driving in front of finally caught up to us as night set in. The winds were blowing hard and the snow was pouring down and the trucks were going very slow. During the trip I was stuck behind three trucks in a row (caravan style). I was tired and it was getting late. I decided that I could pass the trucks and go at least a little bit faster than the trucks so I made the daring move into the left lane. The car was immediately hit by a blast of wind and snow. I couldn’t see anything and had to slow down more than I was already going. Not being able to pass the trucks I moved back into right lane, behind the trucks. Not wanting to go so slow I again tried to pass the trucks and was again met with a blast of snow and wind and again retreated behind the trucks. I then realized that the trucks were blocking me from the harsh winds and snow. Because of this shielding I couldn’t see, didn’t see, the true intensity of the storm. The clouds roll back and the sun shines down on the glistening slopes me the majestic mount hood wrapped in brilliant white. Opps, i need to stay in my lane. It was worth it though. A colony of ants happily dwells in their rocky home until the rocks shift causing extensive damage to their colony. The shifted rocks are no longer a suitable habitation for the colony and worker ants venture out looking for a new home. Every possible nook and cranny is explored until one large enough is found. The individual worker ant inspects the crevice and assesses its suitability for the colony including lighting, water flow and air ways. After the inspection the ant heads back to the colony and waits. The waiting period is inversely tied to the quality of the new site. The poorer quality the site is the longer the ant waits, the better the site the less it waits. Once the waiting time is over the initial worker ant solicits other ants to follow him to inspect the new site. After the second inspection is complete the ants return and again wait, the same waiting rules apply, before soliciting yet another group of ants to inspect. At a critical point, the worker ants that remained in the colony realize that enough ants have approved a site and they pack up to follow them to the new site and the whole colony is relocated. The timing of the waiting period is critical. The worker ant is basically waiting to see if another worker returns bursting into the colony with a 'must have' site. If no other ant solicits before they do then the ant can assume their selected site is the best site currently available. If a better site is located the returning worker ant would also start soliciting ants and the cascading effect ensues but at a faster rate because of the superior site. The quorum part is the large number of ants going to the same prospective site. The sensing part is realizing that the quorum has reached a critical mass and thus a decision has been made. Quorum sensing is used in nearly every type of swarm including ants and bees, fireflies, light emitting bacteria, fish that swim in schools, even mobs and businesses. Each organization using quorum sensing differently, but the principles remain the same. Fireflies use quorums to determine where they should gather, light emitting bacteria to know when there are enough of them to make their light noticeable. Ants and bees use it to determine the most suitable location for the swarm without the time or danger of each member inspecting each site. Mobs use quorum sensing to determine why they are mobbing and what or whom they are going to mob. Often in society we like to think that we are above such a fundamental practice of quorum sensing, but in reality we are steeped in it. No change can ever be effected unless a significant group, either is quantity or quality, approves the change. This is true in the corporate boardroom where leaders are appointed and even for the president of the United States who is elected. Swarms of people wait when new technology and products are introduced for a quorum, usually a select group of famous people, to endorse them new items before they themselves begin using them. Have you ever heard the phrase "I'm waiting until the next version to buy it" or "we'll see how well to works"? These are both cases of waiting until the quorum concludes that the change is acceptable. Another version implies that enough 'ants' approved the earlier version, usually by purchasing it, that the manufacturer could survive long enough to make the next version thus the quorum has been reached. Waiting for reviews of a new product is waiting for another 'ant' to solicit your use of the product; the early 'ant' is convincing you to inspect the new 'site' thus building the quorum. Quorum dynamics are the governing principles behind quorum sensing. Quorum dynamics consists of two parts as briefly mentioned earlier: quality and quantity. Quality is the voting power a particular member has. Some members have a lot of sway, unofficially and officially, while others do not. Some people can give a thousand word opinion and not convince another soul while others can give a single look and convince the whole quorum. In a family the mom would be expected to carry a higher quality rating than a child and an adult child more than a juvenile. Quality ratings aren't always along predictable or constant: an adult child would carry a higher quality rating than their mom on their wedding day. The second attribute in quorum sensing is quantity, simply the number of agreeable members in the quorum. The total number of members is of little importance as few decisions rely on raw votes. For example, the decision over where a family will eat out likely rests with the parents not the four children. The parent's decision may be overruled if the children orchestrated a loud protest, thus exercising their voting power and the quorum decision would have achieved critical mass. Every person with voting power, regardless of quality rating, is a "valid quorum member" and every "valid quorum member" has voting power. Valid quorum members can be adapted to members present and as the situation dictates. For example, when a visiting uncle arrives, though not a member of the immediate family, he becomes a valid quorum member and can affect policy decisions. On the other hand, if a grandfather dies, his grandchildren may have no voting power in funeral arrangements though they might have voting power in decisions about the family's summer vacation. It is also possible to be part of the quorum but to have no voting power. Parents to give a lot of advice to their newly married children and thus influence the outcome of the vote, but they themselves have no voting power. Quorum sensing's critical mass is a function of quality times quantity. For a decision to be made enough people with enough voting power must reach consensus. In the example of the children going out to eat, their consensus overrode the decision of a single parent, but likely would not have withstood both parents' consensus. The threshold for each decision varies based on the importance of that decision. Children will are more likely to influence important decisions like where the family will move to but have less influence over what kind of car the dad buys for commuting to work. Organizations use quorum sensing to sustain leaders and managers. A president may appoint a new department head, but the new department head will still need to get his department to 'sustain' him as a leader. While the quorum is vetting, the employees of the department will lack both trust and confidence in the leader. The quorum is likely to consist of key department staff, key in the sense of office politics and likeability not in the sense of job level or authority. A well liked janitor may have a higher quality rating than an annoying mid-level manager. It is important to remember that only valid quorum members can vote. The bimbo mail boy's vote won't be counted and neither will the department head even though he is part of the quorum. The length of the vetting depends on the perceived quality of the leader, just like the ant's delay in soliciting others to inspect the new site is determined by the perceived quality of the site. The more confident quorum members are in the new leader the more excited they will be to rally behind them, the less confident they are the less excited. Once a quorum member approves of the new leader they will solicit others to rally with them. This process will continue until a critical mass is reached, in both quality and quantity or until the vote fails by default because it takes too long. If a sufficient quorum consensus is never reached then the quorum will either remain divided over the perceived competence level of the new leader, probably causing the larger quorum to divide into small quorums, or the quorum members who voted in the affirmative will retract their vote, and their support, until the new leader is left without a sustainable platform. It is a sad day when a computer help desk doesnt know what cisco or a VPN is. What, do they have "Sliced Old Potatoes" canned up somewhere? I just became one of a tiny, tiny percentage of people to have ever seen the Cherenkov effect live, in person. Today I skipped my classes and tagged along with a BYUI Resource Management class as they went to Idaho National Laboratory. We saw ERB-1, the first power plant in produce usable electricity, and has since been decommissioned. Then we had lunch and saw the real beauty: ATR (Advanced Test Reactor). This is the reactor they use to test materials to see how long they can last. Though I didn't get to see inside the reactor, like the picture below, they did just shut down the reactor and had ejected some fuel rods and moved them into storage in their canal. They were still glowing bright blue. It was awesome. I looked, then when to look else but kept coming back to look again and again. All in all, it was awesome whether it was "once in a lifetime" or not, I am glad I skipped classes to see this. Somehow I thought that being more than 700 miles away from work would mean that I wouldn't be setting up computers for our Sister company's new store. 20 hours later, many of which was spent on the phone between classes, I realize: "no, being more than 700 miles away from from work means that I will spend a lot of time on the phone walking people through how to get things connected and then, once the computers are online, spending hours in a secluded place carefully configuring as much as I can." I am burnt out (and hungry). I recently finished reading two scholarly works for my International Studies class and had an interesting observation. Both of them were incredibly dry. They were not dry because they were discussing boring topics, in fact the topics were very interesting; rather they were dry because they lacked variety and flavor in the writing itself. The first paper's writing style would have failed any English teacher I have ever had if only because the number of times the writers used the term "repudiation". If it were a swear word, a sailor would have been offended. I love the word, especially in context of the paper's topic. It means 'to put off' or 'to shed as a garment', and in the context of newly established democracies it is a beautiful description of the process of reverting back to the more stable government they were used to. My problem is that they used "repudiation" and only "repudiation" to describe this process. Reading the same word repeatedly in a academic paper is just appalling, there are so many more words that could be used to describe what is happening and they should have used them. That way, when they finally do use "repudiation" we, the readers, can be struck by the beauty and eloquence of the word. Instead the writers have robbed us of any opportunity to savor the verbose wording by abusing and even profaning the word. The paper I read before this one was about the conflict between Armenia and Azerbaijan. The story they told was a fascinating story of intrigue, sorrow and struggle, but the writers of this paper committed the same sin as the prior in terms of dryness. It was unbearably boring. What I don't understand is this: do the writers not understand that if 'normal' people could read, understand and enjoy their paper they would take more interest in the issues the papers raise. If people are taking more interest is their papers they would receive more funding (because people fund things they find interesting) and thus be able to research more (because researchers like to research things they find interesting) and other people would then become interested and start working to make changes (because activists like to promote things they find interesting) and the world would become a better place (or at least more people would be happily distracted by things they find interesting). But this doesn't happen because the papers the researchers write are so boring and dry that no one reads them for fun. So what was my take away lesson from these politically bound writings: good writing that captures the imagination, stimulates the mind and enlivens the soul is important even in otherwise bland and boring contexts (such as political science). More so, researchers need to make a choice: is it more important to be "right" by throwing around big words that only their peers can understand OR is it more important to be broadly read because they forsook the "high" language and instead wrote so everyone could understand them? In other words: do they want a few people to enjoy reading their papers OR would they rather most smart people in the world being excited to read their paper? I almost forget the "cry to all mothers with children" part. It is simple. Please, please, mothers, if your children begin to express a deep interest in Political Science make sure they learn the value and skill of good and interest writing, lest the continue to perpetuate the boring research papers that keep the world from knowing and understanding the issues that they work so hard to research. This past week I have been dipping into a variety of cultural experiences that I have found quite rewarding. The week started with playing Twister. Later I watched 2001: A Space Odyssey, which I found to be rather boring until I learned a little secret. If you watch the movie in VLC you can watch it a 2x speed (double time) and except for the few moments of dialog (which I slowed down to 1.25x or 1.5x depending on who was talking) it was quite understandable and in fact enjoyable. Then, in honor of the schools masquerade ball, I listened to the Phantom of the Opera. I found that listening to it was much more enjoyable than watching the movie. I still not sure if AJ finds my random singing outburst to be funny or annoying (except when I lip sync into a 'microphone' which always makes him laugh). I recently put on my white elastic banded socks and wore them all day. It wasn't until that evening while visiting some friends that I removed my shoes and realized that I had worn the wrong socks. I have two pairs of white elastic banded socks. This pair was different from the other pair, and indeed all my other socks, in that they were heavily stained. While I was initially embarrassed over having worn stained socks I quickly remembered why they were stained: I had worn this very pair of socks a few years ago while playing football with some friends in muddy field on a wet Oregon day. The stains incurred were and are an ever present reminder of the fun game that was played and the victory that was achieved after much effort. I had kept the socks as something of a trophy from that game. These stained socks serve as a reminder of my accomplishment. Other stains do not have such fond memories attached to them. Juice stains in the carpet, oil stains on a favorite shirt or blood stains on pants. In many ways each of these was simply part of my life's course. Each also has a memory attached to them, some better than others, and though each has a story none of them elicit the pride of my mud stained socks. Organizations also have stains. The longer they are around the more they will have. Some of the stains are like giant juice stains on the floor while others are small marks of personal accomplishment like my socks. Each has a story and reason behind it and these reasons have shaped the growth of that organization. Even if the stain is cleaned and is no longer visible, those who knew about the stain will still remember it was there. Sometimes you can catch the host stealing glances at the now clean carpet patch, or you notice they avoid it by walking around a perceptively good patch of carpet. Organizationally this may take form as employees refusing to do something because a specific person is supposed to handle it, even if that person is on vacation. They may provide excuses such as "I don't know if I am allowed to do that" or they may lie saying "I'll take care of it" while they are secretly waiting for the absent person to come back and handle it. Sometimes they will blatantly refuse, "Oh, no I can't. Carl has to do it." Policy formation can be greatly affected by minor stains like a pair of old pants that you can't part with, but you never wear because they have a ketchup stain on the thigh. These can be an embarrassing moment the owner had with a customer, a mid-level manager who was publically humiliated by a superior or an employee who said the wrong thing to a customer and was severely disciplined. Each situation can cause new policies that forbid the wearing of the tarnished garment, but not the disposal of it because you never know when you have need a mostly useless policy. Behavioral ethics can also be influenced by stains, or rather the threat of new stains. This happens when people are especially careful around certain individuals who sometimes have "accidents" that may cause a spill and subsequent stain. It may be a viscous manager who, upon offense, spreads your shame across the company, a co-worker who is known to spread gossip and rumors to any who will listen or even an accidental run-in that may cause some awkward questions to be asked. This careful avoidance of potential staining is very different from the careful attention given while wearing special clothing. Not all stains remain hidden. Some are shown off and even publicly aired. These stains, much like the mud stained socks, are symbols of the organization's victory, near death experiences and staying power. They are aired in defiance of their competition and their display are a challenge to their opponents. These stains can be more liberal customer return policies put in place after a viscous battle with a competitor, a special greeting among members in honor of a beloved leader or a signature service performed "because that's way we've always done it". These stains are not always metaphorical, like most of the other organizational stains, but are sometimes literal: burn marks from a fire that nearly destroyed a warehouse or cracks a building's walls caused by a strong earthquake. Often these stains are glorified and incorporated into the organization's myths. The longer the organization has been around, the more stains it is bound to have. Not all stains are bad, in fact many can lead to improved moral and loyalty, but often these stains lead to the creation and sustaining of policies that don't really make sense and can be damaging to the organization and those that associate with it. November is a good month. I'm done with mid-terms and have grades back, I get a new phone and I get to go home for Thanksgiving break. I am excited. Phone (my mobile phone) has not been well as of late. In fact, he is chronically ill (if you can call getting old an illness). His battery used to last for days and now lasts for a day, half a day if I talk to a lot of people. His screen is wearing out. It's not broken, cracked or damaged. No, it's just been used so much that the plastic that protects the screen has split from my hear pressing on it day after day, year after year. The old glue has lost its form and is starting to move after two years in the moist humid Oregon, the dry dusty Idaho and numerous states and countries in between (not really in between but around). So I am slated to get a new phone. Unfortunately, I have to wait as the phone I want is not coming out for a couple of weeks. I found out that I am a better persuader than I normally gave myself credit for, but this time it wasn't really for much good. The Disneyland Dad wanted to know what he could do to get more out of his ailing laptop and I told all the coolness of mine, Justice (which is actually the company's laptop), and now he wants it back for himself. So, I have to find another laptop in November. November also means that the world, or Rexburg at least, is getting colder and thus my nose will be getting cold. Have no fear though, I have a plethora of cold weather gear including some wonderful scarfs that will keep my nose warm. I really have nothing on this distant planet that is sometimes the farthest planet and sometimes not (it's true). It just fit with the theme. “Ohhh,” the tech said over the phone. “I understand now what you’re saying.” I was glad because I was running out of ways to say what I had already said. The buildings location was so clear to me and I thought I had explained clearly where the new building was. Unfortunately, the building was also clear to the tech and my directions did little to clarify the situation. Boss had questioned me about the installation of some communications equipment. I deferred to the tech’s judgment, thinking he knew best. He had been out to the site and knew what was needed, right? Boss kept questioning though, so I finally broke down and called the tech. I was wrong; he hadn’t been out to the sight. He was going off his memory of the original installation. He didn’t know that we had added two more buildings after the initial installation, and they were on the opposite side of the pad from what he thought. This was a classic example of lateral communication breakdown, mostly because of distance. Boss and I were communicating via email because I was out of state, the tech and I always talked over the phone except when he was on-site doing work. Some important concerns were being lost in the communication methods being used. I didn’t understand from Boss that the tech was convinced that we need to mount communication equipment at the opposite end of the complex, the tech didn’t understand that we had added new buildings in different places and Boss didn’t understand why the tech didn’t want to put the equipment in the logical place. It took me several minutes, most of the call, to realize that the tech didn’t know about the new buildings but once he knew about the new buildings he readily agreed that the equipment should be placed where the rest of us thought it should be. One intriguing part of lateral communication breakdown is that frequently nobody knows that other people are missing information (often the other people don’t even know that their missing information). Nobody knows that nobody knows because what everyone has makes sense to them even though what everyone else gives them doesn’t fit. Some months ago I was involved in a management retreat for work. The retreat's primary agenda focused on a proposed reorganization of the company. The entire first day discussed the ramifications of the changes and what the company would like after it was complete. As we worked late into the night we started planning the timescale for the reorganization. At the beginning of the timescale planning the question was asked, “Do we all agree to do it?” There was a long silence. No one wanted to commit to the process with so many unanswered questions. Slowly a new discussion emerged that was a rehash of an old discussion: We don’t know because we don’t have all our questions answered. The discussion was prolonging the issue and allowing us to answer around the important question. Just when we seemed doomed to revisit the entire days meeting Hero raised his hand. He waited for the room to fall silent before speaking. “I think we are asking the wrong question,” he said. Then he told the story. As a young man he had decided to buy a house. At the time the housing market was ripe with small 2 bedroom houses. Hero didn’t have any need for a bigger house and in fact was quite contend with a small house. The Realtor took Hero to see various houses all of which had the same fatal flaw: they were old. Hero was not a very handyman when it came to fixing up houses. The Realtor pointed out that in order for Hero to sell the house again, at an increased value, work would need to be done. Then one day the Realtor took Hero to a small house tucked down a short private street. The house, along with the two others on the street, had been built by the same construction company who had been renting the houses out. Their policy was only to rent for a couple of years then to quickly sell the house. The duplex on the corner had been sold previous, the larger house at the end was too expensive and was already being battled over, but the three bedroom house in the middle was just right. There was just one catch. In order to get inside the house to see it Hero would have to put in an offer to buy the house. The Realtor explained that this was not too unusual of a request because it was currently being rented out. The solution was simple: the Realtor would include a clause that the offer was contingent on Hero’s inspection of the inside. He could, for any reason, back out if he didn’t like what he saw on the inside. The offer was written and accepted in short order. Hero and the Realtor inspected the inside. “You buy it,” the Realtor replied. “What if the inspection comes back bad?” Hero asked. Hero thought for several minutes then turned to the Realtor and said, “Yes”. A month later he owned the house and has happily owned it since. One by one, each member of the Company’s management stated “yes” in agreement with the plan. I pondered on the difference between the questions; they were small differences but had a profound difference. The first was asking for blind commitment, asking if we would all back, no matter what came, the plan that was presented. The second is a question of intention, asking if we are commitment, short of major problems, to see the plan through. The second question is much easier to answer than the first. There is an additional benefit to commitment to intentions. By committing the group to its intentions Hero had in a single moment committed the Company to an end goal, not the process that would take it there, another subtle difference. Often in these meetings we decide that something needed to be done and how we would do it. Our commitment was usually to the process, not the end result. So when the process was complete and we didn’t get what we wanted we were left hanging, not sure what to do not. Being committed to the end goal meant that no matter what we were traveling until we got our desired results, or discovered they were unachievable, and we wouldn’t stop until we got there. Finally, committing the management team to its intentions, not the process, did much too safe guard the pride and honor of the team. Instead of having attached their name to the process, which may or may not have been the best course, they had attached their names to a carefully analyzed, examined and thought out end goal. Even if the proscribe process as outlined in the retreat were to utterly fail, the team still wouldn’t have failed. Though the process could have been flawed, the goal itself was solid. Postmortem: The Company's reorganization continued, not entirely as planned, but well enough. In hind sight, out commitment to intentions that Hero had gathered proved invaluable when tough decision needed to be made. In class we had been talking about barriers to communications and I was reminded by this story. Communications in that retreat and sometimes during the reorganization process began to crumble as the road got harder and, more particularly, when it wasn't clear where we were headed. Having a clear understanding of the Fathers' intentions help everyone to back up during high stress times to remind ourselves why we were doing all this work. In my Comm class we talked about things that can be done to foster lateral communications in organizations. One suggestion was to turn cubicles and work spaces inward so everyone shares a common area, perhaps even with a white board. Later that afternoon I came home find that one of my roommates had purchased a number of paintings from DI and replaced the old tired paintings with new tired paintings. The change was inspiring and I longed for a white board to add to the mix. Then an idea struck me. What is a white board? It is a white laminated non-porous surface. What else is a white laminated non-porous surface? A refrigerator. So we have converted our fridge into a community white board (thanks to magnetic dry erase markers). Information, quotes, drawing, jokes and points now flow easier through the apartment. I think everyone resident, and a few non-residents, of the apartment have used the pseudo white board. How true the priciple is: give the community a low tech, easy form of self expression and it will come together to use it. Friday I was studying my scriptures and notes that the binding, which has been disintegrating for some time, was about ready to let go of the cover altogether. More than a year ago I had saved money to buy a new set of scriptures and I finely bought them. It is a little odd studying out of my new scriptures, good and bad. I miss many of my old notes and writings but it is also good to have a fresh start and not be reminded of my juvenile writing, comments and highlights. Farewell to the old and hello to the new. In my communications class we were talking about barriers to effective communications. One of the most prevalent barriers to communications that my work experienced early in its life was being too nice. I remembered a classic Customer Service ‘Come to Jesus’ meeting. The problem was that we had good Customer Service staff. They were really good, so good in fact that they handled much work that belonged to other people. We found that they did other’s work so well that the others couldn’t do their own work, partly out of laziness and partly out of inexperience. In the ‘Come to Jesus’ meeting we changed that we discussed the difference of being helpful and being really helpful. The difference in longevity. To be helpful, to do things for other people that they can handle themselves on a permanent basis, helps that person for a time. The downside is that they then become dependent and are indeed handicapped by the help. Without the continued effort and knowledge that is gained by experience over time you lose the ability to handle new events and even old events that should be routine. In life this can be seen by observing teenagers and young adults whose parents have coddled them their whole like. Then when they leave their parents they are incapable of handling real-life events (e.g. working for an employer, dealing with a parking ticket, having to be a real friend). Instead of a helpful staff, we wanted a really helpful staff. To be really helpful is to teach people how to do things and then after a reasonable amount of training to stop helping the, thus making them do when they should have learned to do. To work with an old analogy: you need to teach a man to fish, but if you keep feeding him while he is learning then he has little incentive to become good at fishing. There was a marked difference after the ‘Come to Jesus’ meeting in the performance of the other workers. For a time, a painful time, the Customer Service staff helped train and explain how to do things and why they needed to be done but eventually they stopped assisting with the work and expected it to be done. Over time performance was dramatically in almost every department. Further, people become smarter because they were able to gain experience through continued effort and thus expand their skill set. Over time, a painful time, we as an organization became stronger and more agile. The other day we learned about the intriguing Brain Theory. In an organization, brain theory applies to a distribution of information. It says that every job in an organization should be known by at least one other person. At first this seems like an ideal organization one capable of recovering from any disaster, hardship or vacation. But such an organization has an inherent flaw: such an intensive level of information sharing would bog down the normal lines of communication until the organization ground to a help. So an alternative is available: allow each secondary section to have moderately out of date information. This would reduce efficiency but also reduce the amount of information flowing and thus let the different section focus on their primary function while allowing secondary information to trickle in over time instead of flooding in constantly. A balance would need to be struck between how often the information would need to be updated versus how efficient you expect the replacement worker to be. An example of this can be seen, or experienced, when mothers take the night off leaving the father to tend to the children. Although they are part of the same organization (unlike a babysitter/temp worker) the husband is taking on a role that he doesn’t normally fulfill, thus is required to have a secondary knowledge of the mother’s functions. Sometimes the father’s knowledge or skills of keeping up the mother’s routines are lacking enough that the father just lets the children do as they please. Sometimes his secondary knowledge and skills are fresh enough that he can maintain the mother’s pace without missing a step. A salamander (or newt, we're not really sure which it was, though we did name him Sampson and tried to find him a warmer home, more on that later) doesn't do so hot in the freezing cold. No-show socks in boots don't go well together. The boot rubs weird on your feet and pull leg hairs AND worst of all the boot slowly slides the sock down the heel, then under the heel until the whole of the sock is wrapped around the toes. Boots don't have to be tied to work and in fact with no-show socks I think it works better as the socks don't seem to shift as much and if they do it is much easier to remove the boot and correct the sock. Elazar shouldn't be parked next to the vintage car in the parking lot because the vintage car has a cover and Elazar doesn't. He feels a little bad but he isn't going to get a cover. Idaho snow mocks you on the First Day of Snow by only snowing on trees, grass, cars but not a real snow that sticks to the pavement. The Idaho Snow Coat was a little bit of overkill. It's still sweatshirt weather. Happy First Day of Snow! Every morning I look out the window in anxious anticipation. I look for two things: is my car Elazar still there and is there snow on the ground. Thus far I have been pleasantly surprised with a yes and a no. Yes, Elazar is still in the parking lot generally where I left him and no, there is not snow on the ground. In another month I won't even need to look, for the snow at least. It will just be a given. Until then I keep looking. Take one: In my Eastern European Studies class we were recently talking about how myths, legends and superstitions impact the local. A girl in my group commented that already Slovakia has already started to check their language after only 16 years away from the Czech Republic. Previously we had identified that language was a key factors in establishing identity. Add in two: In my Communications class we talked about how cultures are formed in organizations. Blend them together: Cultures, in and out of organizations, often form their own languages, or at least their own sayings and lingo. This language helps to strengthen the bond of the culture and creates a sense of belonging. Take a step back: I recently called our corporate office about an issue with our order processing. During the conversation I blurted out an acronym we use to describe the order process. The corporate guy didn’t have any idea what I was talking about. I said it again thinking I misspoke. I hadn’t. We had in our short four years of existence created a unique diction that even our corporate office didn’t understand. Result: Cultures develop their own unique diction to protect their unique identity, identify outsiders and insiders, feel special and communicate quickly about things important to the culture. "They're just not the best person for the job," Boss said. "But it could be anyone," he continued. "We picked Friend almost at random," he sounded a bit defeated. "We're paying Friend too." He paused for a moment before continuing. "It could have been anyone: Confidence, Smooth, Respite, anyone. Truth, we just picked Friend without thinking who would actually know the best price to sell it for." "But at least we would have some money," I said. "Some money now is better than a little more money later. Isn't it?" "I guess so," Boss said in defeat. "If nothing else, we'll at least have a catalog of the stuff." There was a brief moment of silence. I was about to escape when Boss tried once more. "Stalwart would be better," he exclaimed. "But look who we have painting doors at the DC," I said. I had spent most of that morning painting three days at the warehouse. "You didn't have to paint those," Boss said. "Stalwart could have done that. It would have taken a week, but it would have been the right person." "And yet, it has been four years since we got those doors and they still hadn't been painted," I said. "At least this way the doors are painted and we Friend will sell some of our stuff." There was a moment pause between us. "It is better to just get it done, even if it is the wrong people doing it," I said as I smiled and left. The moral is that sometimes you can use management to get things done but sometimes you can't. Sometimes everyone, including the managers are so busy working on yellow alert with nearly critical issues that the small things slip through the cracks and once they have slipped long enough, like unpainted doors, you get used to them and stop thinking of it being incomplete and just think of it as a bad job. At least, one week before I leave back to school, the doors are painted. What seems like forever ago (2 years) I changed hosting accounts for my domains, including evanko.net, to consolidate my various websites into a single hosting location. The move was swift and brought with it the current layout and added a photo gallery to the mix. The photo gallery made me happy. There was but one problem, I only had 5 GB for all of my sites. That may seem like a lot but some of my sites are pretty big. So for two years I have been making sure to not go over my capacity. Today I logged into my hosting site and notice a different number in my disk space. It didn't make since, and still doesn't, so I called and asked. Apparently I have 150 GB for my sites. Suddenly I feel rich with web space! "Are you going to take the car of the ferry?" "There's a ferry!" I exclaim. "Yes, Daniel. There's a ferry," my father replies in a patient tone. As I had time to think about it I did vaguely recall that the directions I brought up to figure out how far it was to Victoria mention a ferry, but I had forgotten. I thought they would have built a bridge, but I guess spanning a large stretch of ocean is too difficult. Out timing was perfect though: we arrived in time to run, literally, onto the ferry. This is from the "Sunken Garden". This part of the gardens is in an old limestone quarry. It reminded me a bit of Alice in Wonderland. The stair that led to the top of the a stone platform in the Sunken Garden. Moss bears. They had a variety of moss animals, including moose. and squirrels, but no real animals. Victoria is the capital of British Columbia. This is their Parliament building. Commission is such a wonderful word. It can mean so many different things. For example, one can get paid commissions for selling something. Also, one can commission something to be done in which case one would become the commissioner. As I read this sign I first thought of the second example and then thought "at least they have a central person to get conflicts of interest going. In the states we wait for them to happen almost by accident." A walkway into the ocean, in case you don't want touch the sand. Seriously the beach is so skinny I don't think that even with the tide out this would do you much good. Literally a house boat neighborhood. There is is blocks worth there. I have decided, after years of trying to capture the majesty and beauty of sunsets, that it can't be done. Well, not so much that it can't be done but that it's not supposed to be done. You're not supposed to be able to look at a picture and get the same peace, calm and tranquility as if you were standing atop a hill watching the great blazing sun surrender to the pale, piercing moon; as the world shifts from its vibrant, lively colors to the sharp, silvery hues of night. Sunsets, as with sunrises, would turn into something of cheap experiences not worth having if we could just flip through a book that had capture the same richness as if we had seen it with our own eyes. There is also the matter of timing. Being at the right place at the right time to watch the sun or moon rise requires careful attention to their timing. It is a reminder that no matter how important you are, no matter how well you calendar, no matter how many alarms you have, the sun will set whether you are there or not. It is a reminder that no matter how small you feel, no matter how insignificant you see yourself, no matter how desperately you want more in life, the sun will rise whether you are there or not. It is one of only a few events that the time is completely arbitrary and completely out of our control. Sunsets are not tied to a precise hour and minute but rather to a precise moment, a quiet moment, a solitary moment, a moment that we can let our souls revel in the beautiful and decisive timing of the universe. The moment is so unlike any other we have in our lives. That moment serves to remind us that we are both the grand and absent. We can see it, experience it and enjoy it but it would happen just the same without. Seeing the moment reminds us that God has definite precision though we are sometimes too small to see it. But it is there as surely as we watch as the sun lowers itself over the edge of the world. August came and I was getting ready to go back to school. Through the hectic process of purchasing store of stuff and opening two stores of our own a lot of stuff that nobody wanted to deal with at the time had been crammed anywhere it would fit. Most of the stuff went to a back corner of the warehouse where few but me ever ventured. Through the summer I had grown tired of hearing “didn’t we buy one of those from the stores?” The rumored list of the items purchased had proved impossible to find, and I wouldn’t have trusted it anyway. I decided it was high time to gather all the technology stuff from everywhere, get rid of the useless stuff, repair the worthwhile stuff, and get as much as possible into production. Going through the warehouse was fairly easy as most of the technology was in one place. Confidence and I took a truck load of stuff to a donation center and I began amassing a second pile. After the warehouse was cleaned out I took on the supply room. The Supply Room had long ago become the premier storage center for everything that nobody knew anything about. I decided to clean the whole thing out and organize it. I had chosen the perfect day as there were few other people around to monitor what I was throwing away. My general rule: if we haven’t used in four years, we probably won’t use it in the next year. The donation pile grew and grew, nearly doubling in size. Towards the end of the cleaning I rearranged the files and tackled the bottom shelf. On the bottom shelf was a number of white Plexiglas sheets with white tube screwed to them and wires running everywhere. 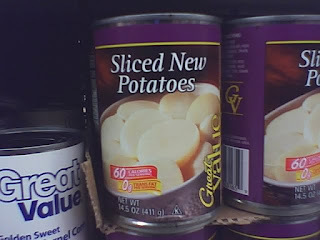 They had appeared on the bottom shelf sometime while I was at school and nobody knew what they were. I pulled them out and as I carefully read the tiny writing of the tube and realized that alien-like things were the antennas that go to the used wireless devices. I had seen them all summer, it just took a while to realize that I was actually looking for them. If they were snakes they wouldn't have gotten me. But if they were walking sticks, they could have stayed there for a very, very long time.